Union public service commission recently published the official exam calendar and time table for upcoming recruitment Notification and examination which will be held in 2019 by Sangh lok sewa ayog . 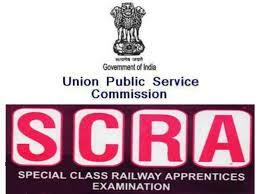 all candidates who are waiting for UPSC SCRA Recruitment Notification 2019 are informed that UPSC published the details exam schedule for Upcoming Special class railway apprentices examination 2019. According to official Notification SCRA exam 2019 notification will be published on October 2018. All interested candidates can fill application form till the last date which is October 2018 . selection of the eligible candidates for SCRA bharti will be based on through the written examination which will be held on January 2019 at various examination center of all over India. UPSC SCRA examination is one of the golden opportunity for Intermediate students who want make their career in Indian railway . class 12 appearing and qualified candidates can apply for SCRA recruitment examination . UPSC every year conduct an examination for selection of the eligible candidates for appointment as special class apprentices in mechanical engineering department of Indian railway and other department of Railway . Education qualification: Intermediate with First Division or second division with mathematics and at least one subject physics and chemistry as subject of the examination . Graduate with math and at least one of the subject physics and chemistry as their graduation can also fill application form. With at least 1 subject physics and chemistry as the subject of the examination. Selection Procedure; selection of the eligible candidates will be based on through the written examination followed by personal interview test. Negative marking or minus marking will be applicable in the written examination. All question of the written examination will be objective type and MCQ based. Question paper pattern of the written examination. Examination of SCRA recruitment will be held according to following . Previous year Cutoff marks Data Minimum qualifying marks for the written examination , personal interview test. Personal Interview test : all those candidates who will be declared qualified in the written examination they will be call for personal interview test .UPSC SCRA personal Interview test will carry total 200 marks . Final merit list will be prepared on the basis of marks obtained by the candidates in written test and Personal interview test . UPSC SCRA examination Center: Examination center will be allotted on the basis of first apply first allot. How to apply : all interested candidates are required to fill application form online at the official website of UPSC Online. First of all candidates are required to do online registration . after filling registration form at UPSC official website just general application form fee challan and pay application form fee at the prescribed bank for paying application form fee. Candidate can also deposit application form online via using their Credit card, debit card and net banking , after paying application form fee each candidates will get unique journal no or challan . Candidates are required to revisit official website of UPSC and submit fee details and complete the registration process. Candidates can deposited offline application form fee before then one day of the last date of application form submission. There is no application form fee for Physical handicapped person , Female candidates , SC and ST candidates .